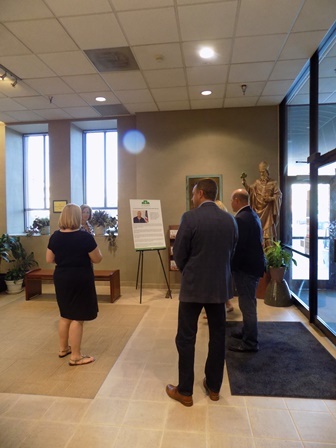 On a bright Friday morning, parishioners of St. Alban Roe Parish in Wildwood, Missouri toured St. Patrick Center, St. Francis Community Services and Cardinal Ritter Senior Services, three federated agencies of Catholic Charities of St. Louis. “We are here today to learn more about Catholic Charities and to understand the missions of the agencies, so we can truly be impactful as a parish to the needs of Catholic Charites,” said Jim Ringland. “We are so grateful for this group of parishioners of St. Alban Roe Parish walking a new path with Catholic Charities of St. Louis to increase the awareness of our federation of eight agencies in their community. It’s so much more impactful when the amazing work of our agencies and client success stories come from within,” said Brian Thouvenot, Chief Development Officer of Catholic Charities of St. Louis. 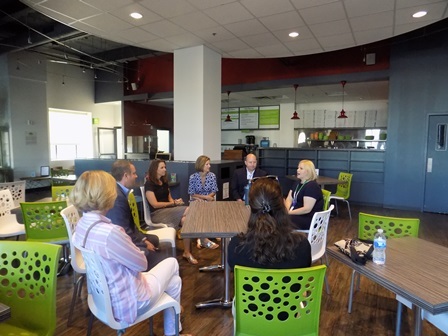 At St. Patrick Center, Mary Kitley, Ch ief Development Officer, discussed the Housing First philosophy of the agency and talked about connecting clients to affordable, long-term housing. Parishioners also toured the agency’s clothing shop and food pantry, all well-organized by a team of dedicated volunteers. “I did not know what Catholic Charities was all about, so I came here today to learn and tell the story to my parish. I am here so I can spread our personal stories from this aspect of the tours,” said Joanne Ringland. A few parishioners journeyed to the agencies today as they are new residents to the St. Louis area and wanted to learn more about Catholic Charities. “Being new to the area, I wanted to learn more about the community and how to support my city,” said Sara Burlage. Next stop was St. Francis Community Services Southside Center, where the tour participants saw their Panera bread collection being distributed that day to families. “I think it is important to build awareness of the accomplishments of the agencies, and how St. Alban Roe can support for these great missions… to see the Panera bread today was such a great moment,” said Mary Schroeder. Meredith Rataj, Site Director, shared the mission of Southside Center where they address the needs of immigrant and refugee families. The parishioners toured the Vietnamese Health Clinic and Youth Services program, as the prepping for summer camp was in full force. 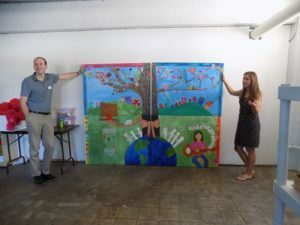 “It’s important that I tour today share with my kids and church how important to support and to volunteer, especially finding ways to connect with the children here at Southside,” said Erin Greiner. These tours are part of a larger initiative for parishes to connect and support the agencies in a meaningful way. “We are hoping with this pilot group of Catholic Charities of St. Louis ambassadors to create a model for other parishes to follow. 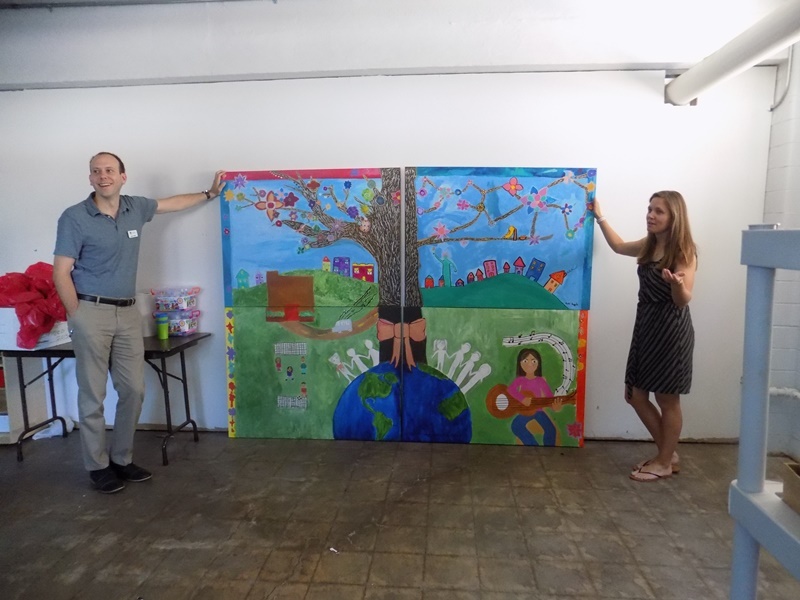 The goal is to connect our agencies with parishioners who can volunteer, provide a needed clothing, food or toy donation, offer their expertise and knowledge and maybe even attend an event,” said Brian Thouvenot. The tour wrapped up with enjoying live music and touring the facilities at Cardinal Ritter Senior Services. 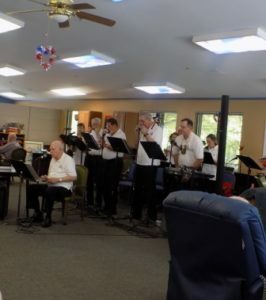 Listening to the St. Louis Harmonica Group perform at the Adult Day Program, one parishioner reflected on how amazing it was to see the agency’s mission in action. “What a great opportunity to see the impact first-hand and get a sense of not only needs but also their successes,” said Jim Ringland. We want people to know all that goes on inside the agencies of Catholic Charities of St. Louis. On this particular tour, our group learned about a volunteer nicknamed ‘Super Steve’ who coordinates the food pantry at St. Patrick Center; saw how their own parish’s collection of left-over Panera bread was being used at St. Francis Community’s Southside Center; and heard a harmonica group playing to an energetic crowd at Cardinal Ritter Senior Services’ Adult Day Program. It was a really cool day!,” Thouvenot concluded.